This site came about back in 2002 because I got a computer, tried to find a spy soundtrack site, and couldn't! It's a sort of reference piece for people who dig the whole 60's spy scene and realize all that silliness needs just the right kind of music. I'm not interested in hoarding rare LPs that collectors want. I just like the music. To that end a CD is preferable to an LP, a nice clean mono LP is better than a trashed stereo copy, and bootlegs are only bad if there's a legitimate release available. People with rare, sealed, un-played LPs stashed away should be ashamed of themselves. I enjoy file-sharing old, out of print LPs as much as the next guy, but if there's a legitimate release out there, you should buy it! So there! It's surprising how much of this stuff is out there and how much is only now seeing the light of day. When we started it was still a matter of tracking down rare LPs, but since that time so much has surfaced on CD... and some of those are already becoming scarce! 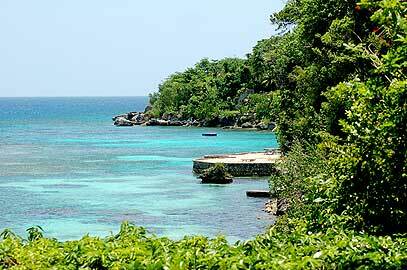 View from the deck - Goldeneye, Jamaica.